Belgian waffles were created for the 1964 World's Fair in NY. They have a crispy outside and are soft and moist on the inside. 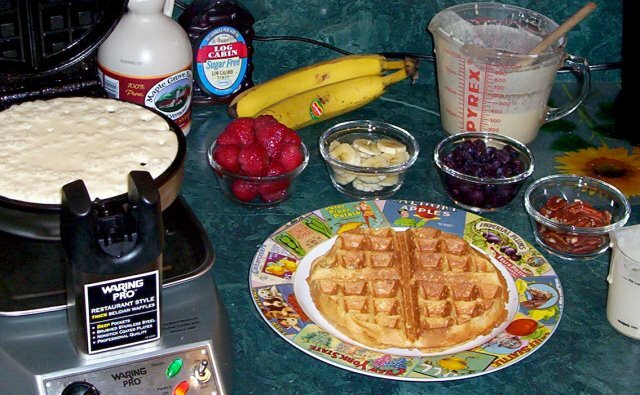 Try these waffles with your favorite syrup or a topping such as sliced fresh strawberries and freshly whipped cream, Bananas, Ice cream, blueberries, cherries, pecans... or all of the above. Put the flour and salt into the large bowl; stir to blend and reserve. Add the egg yolks, one of the egg whites, and remaining sugar to the yeast mixture; stir to blend. Add the remaining water, milk, melted butter, oil, and vanilla; stir until the mixture is smooth. Stir the liquid mixture into the flour mixture and beat until the mixture is smooth. Beat the egg whites until stiff peaks form when removing the mixer. Fold the egg whites gently into the Belgian waffle batter. Let the batter stand for 1 hour, stirring every 15 minutes. For best results, do not open the waffle maker during cooking of the Belgian waffle recipe. Doing so will offset the timing mechanism. Measure out enough batter for your waffle maker and pour into the preheated waffle maker. Use a heat-proof spatula to spread the batter evenly over the grids. Close lid and bake the Belgian waffle in the waffle maker until it indicates the waffle is done; in professional waffle makers, this is usually indicated by a light, a tone sounding, or both. Remove waffle and repeat until all batter is used. Waffles may be kept warm in an oven at low-heat (200°F). Place Belgian waffles on a cookie sheet on a rack in the warm oven. Serve with whipped cream, fruit, jam, powdered sugar, or a warm fruit syrup. Most of the mixing for this Belgian waffle recipe is done the night before. In the morning, just mix in the eggs, vanilla extract and a pinch of baking soda while the waffle maker is heating. Leftover batter may be covered and kept in the refrigerator for up to 3 days. Heat your waffle maker in the morning, stir the batter and have a freshly-baked Belgian waffle for breakfast. Preparing the Belgian waffle recipe before baking. The night before, or at least 8 hours before baking, combine the warm water, granulated sugar, and yeast. Let stand 10 minutes, until foamy. Stir in the warm milk, melted butter, and salt. Beat in the flour until smooth (this may be done using a hand mixer on low speed). Wrap bowl tightly with plastic wrap and let stand overnight (or for 8 hours) on the countertop - do not refrigerate. While the waffle maker is heating, stir the eggs, vanilla extract, and baking soda into the batter. Remove waffle and repeat until the desired number of Belgian waffles has been made. Cover remaining batter and place in the refrigerator for up to 3 days. Waffles may be kept warm in an oven at low-heat (200°F). Place Belgian waffles on a cookie sheet on a rack in the warm oven. Serve with whipped cream, fruit, jam, powdered sugar, or a warm fruit syrup. Mix well. Pour into Belgian waffler for an extra light waffle. Makes four Belgian waffles. Preheat waffle iron. In a medium bowl, combine flour, baking powder and salt. stir in milk, egg and vanilla just until blended. Pour 3/4 cup batter into waffle iron and bake according to manufacturers directions. Remove waffle from waffle iron. Scoop 1/2 cup frozen dessert onto waffle and top with 2 teaspoons whipped topping. Add strawberries if desired. Repeat with remaining batter. Sprinkle yeast over warm milk; stir to dissolve. Beat egg yolks and add to yeast mixture with vanilla. Sift together flour, sugar and salt; add to liquid ingredients. Stir in melted butter and combine thoroughly. Beat the egg whites until stiff; carefully fold into the mixture. Let stand in a warm place about 45 minutes until mixture doubles in bulk. 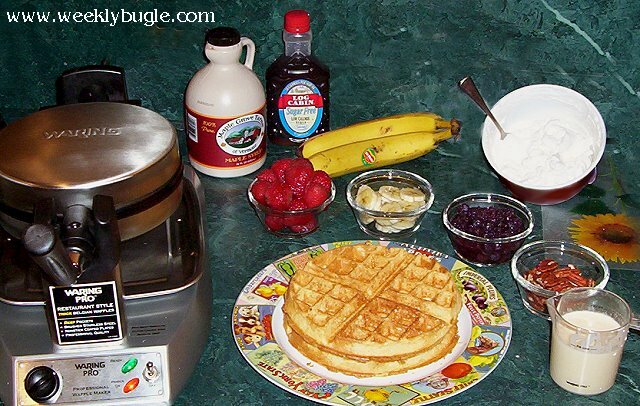 Use 7/8 cup mix per waffle. 1. Blend in all ingredients, using a whip. 2. Pour into greased (sprayed with Pam) hot waffle iron. 3. Sprinkle Pecans over the poured batter. 4. Close lid, cook until golden brown. 5. Serve with butter and heated pancake syrup or serve with sweetened fresh or frozen strawberries; top with whip cream. In 1 qt. casserole, microwave cream cheese on HIGH 30 seconds or until softened. Stir in soup until smooth. Add remaining ingredients. Microwave on HIGH 4 minutes; stir once during heating. Serve over waffles. Garnish with chopped tomatoes. Makes 4 servings. Blend berries and soy milk until smooth. Mix remaining ingredients, add to blender and combine. Make 1 cup sized waffles. Cook between 6 and 7 minutes on high. Cooking longer will add crispness, but can burn. Food processor method: Put the flours, sugar, baking powder, baking soda, cinnamon and salt into a food processor. Process briefly to mix. Add the buttermilk, or yogurt and water, egg and oil. Turn the machine on-off (pulse) 3 or 4 times to make a smooth batter. By hand method: Put the flours, sugar, baking powder, baking soda, cinnamon and salt into a large bowl. Measure the buttermilk in a 2-cup glass measure. Add the egg and oil to the measuring cup. Beat with a fork or wire whisk to blend. Add to the flour mixture and stir to form a smooth batter. heat the waffle iron; grease it lightly. Pour in the appropriate amount of batter and spread to the edges. Close and cook until the iron will open easily. Keep finished waffles or pancakes warm in a 200'F. oven - pancakes on a plate and loosely covered to keep moist; waffles directly on the oven rack, uncovered, to stay crisp. Makes 8 4" pancakes. Serves 4 (if you each eat two). In a bowl, mix cornmeal, flour, sugar, baking powder, soda and salt. In another bowl, mix butter with egg yolks and 1/4 cup of melted butter. Pour liquids into dry mixture, stirring to moisten well. Whip egg whites until they hold stiff peaks; fold into batter. Bake in a preheated waffle iron set on medium high heat or in an electric one set at medium high (375 degrees). Brush grids with melted butter; half fill with batter, spreading slightly. Close iron; bake until waffle is golden brown, 5 to 6 minutes. Serve hot with butter and syrup. In a mixing bowl, combine flour ,sugar, baking powder, cinnamon and salt. In another bowl, beat egg yolks slightly. Beat in milk and cooking oil. Add the egg yolk mixture to the flour mixture all at once. Stir just until combined, but still slightly limp. Stir in the chopped apple. In a small bowl, beat egg whites until stiff peaks form ( Peaks will stand straight.) Gently fold beaten egg whites into batter, leaving a few fluffs of egg white. Pour some of the batter onto grids of a preheated lightly greased waffle baker. Close lid quickly. Do not open during baking. Bake according to manufacturer's directions. When done, use a fork to lift waffle off grid. Serve with warm maple syrup and butter. Top with fresh fruit, if you like.